unlike the majority of bicycles tested on the post, we can't set off by discussing the relative diametrs and shapes of the various tubes - well, we could, but it might be quite a short conversation. a brompton, is a brompton, is a brompton, though, to be fair there are three basic styles of folding bicycle on offer from this british manufacturer. since the review model was going to be pedalled around the windy prinicpality, i asked that they send the p type version which has a set of handlebars that, wired correctly, you could probably receive freesat on. 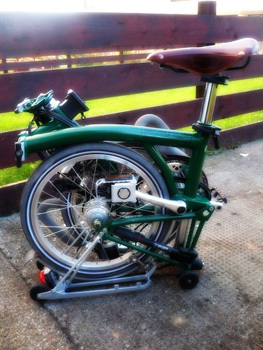 bromptons are used for all sorts of purposes, though predominantly that of inner city commuting. the p-type is geared (if you'll pardon the pun) towards light touring, something that could possibly be garnered from those handlebars, and seemed a more pragmatic choice for islay's roads. of course the really difficult bit about a brompton, is how to make it into a bicycle in the first place. i assume that everybody, except those who collect from a dealer, receives their brompton all folded up. i certainly did, in a box merely half the size of the one that delivered the museeuw mf5. not unexpectedly, the bicycle is not featherweight, that substantial main tube being of steel and, indeed, all the others attached to it. so it is a bit of a heft lifting out of its box and sitting it on the floor, though moving it about a bit is graciously eased by a wheel in each corner of the rack. now, because i can hear little cogs whirring inside reading heads, we shall progress to the ingenuity that is the brompton folding bicycle: the rear triangle, including wheel and rack, clip into place just behind the seat clamp, unhitched by flipping a lever below the clamp. this means that this section folds under the main tube, which is curved to allow the wheel to fit snugly. the seat assembly - topped by a beautiful honey coloured brooks b17 saddle - consists of a very long, polished, telescopic seat pillar, inside which fits an aluminium alloy seatpost featuring a custom saddle clamp. when lowered to minimum height, this prevents the rear section from opening when the bike is lifted. at the point at which the rear triangle snaps into place, there is a small suspension block providing a modicum of suspension when riding. the front wheel section hinges at the front of the main tube and folds parallel with the frame, and a plastic hook on the front fork dropout hitches over the folded rear chainstay. when those bars are unclamped and folded forward, they flatten against the front wheel in its folded position, clipping into a latch positioned on the rh fork leg. the wheels are 16", which is a tad smaller than most on the market, and a size i had to rummage for in thewashingmachinepost bike shed in order to carry a spare inner when out pedalling. 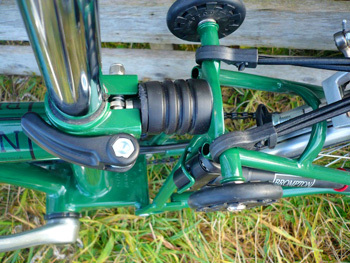 cleverly, the left pedal, which would catch unsuspecting legs and furniture, also folds flat onto its crank. the right pedal is safely contained within the folded dimensions and is therefore, a standard resin model. all the hinged sections mate to each other by way of a welded, and very sturdy square cross section. 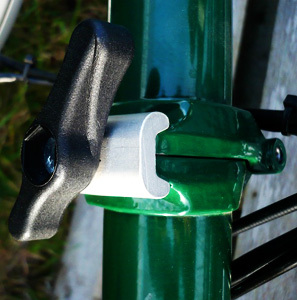 when pushed together, a substantial aluminium clamp is screwed in place by a large, plastic coated handle. it's very difficult to not clamp each section properly, and there's no chance of the clamps giving way. so that's the folding process. the worst part is discovering that brompton have a video on their website showing the whole process (perhaps a little too slickly for brompton newbies). not finding this out until a few days into the test, meant that i figured it all out by myself. but it was fun. the clever bit to which i alluded earlier is that, when folded thus, the four wee plastic wheels on the rack allow the bike to be wheeled along by the saddle. portability. so what else do you get? well apart from that to die for brooks saddle, there's a brompton badged chainset (stronglight perhaps?) chained to a sturmey archer six speed gear. not being an habitue of internal hub gears, a sturmey with a derailleur arm was of great intrigue. the rear hub has two sprockets on a sturmey three-speed, thus providing a total of six speeds. 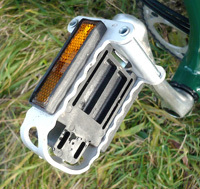 this connects by some lengthy bits of cable, to two brompton badged gear levers on the bars; the left one controls the derailleur and shifts between the two sprockets. the right lever changes the internal hub gears. there's little doubt that the sturmey adds a good bit of weight to the bicycle, but it does keep most of the twiddly bits away from road crud. remember, the wheels on this are a lot closer to the ground. braking is controlled by two standard levers with the calipers cabled from the bottom. the calipers are also brompton badged, and i wouldn't like to hazard a guess as to who makes these - it might even be brompton. i believe the tyres may be schwalbes (pure conjecture), but they too have a brompton logo on the sidewall. the p-type is fitted with a basta dynamo, actuated by pressing a button on the dynamo bottle and moving it into contact with the rear tyre. thoughtfully, a slot has been cut out the right side of the rear mudguard to prevent fouling. it is very unlikely that anyone buys a brompton bicycle in order to marvel at the technical and mental ingenuity that created it in the first place. i can guarantee that you will garner an audience for the folding process first few times out, especially somewhere like islay where there are no other bromptons for many a mile of land and sea. so having unfolded it, it's time to ride it. getting the saddle height correct took one or two stops along the way, and if you ever avail yourself of one such machine, i would heartily recommend marking the correct position with an indelible marker once you're sure it's right. the folding pedal is quite ingenious, but i had a bit of difficulty keeping my foot in place while riding - smooth surface or otherwise - but no such tribulations on the normal pedal on the right. still, i'm used to wearing carbon soled road shoes with a cleat on the bottom of each, so i might just be clumsy. the position on the brompton is a whole world away from a colnago; the squarial bars were a bit too close for my liking, though they provided suitable relief on the drops at the bottom. riding in this position is actually a whole lot better than it looks like it might be. the downside, of course, is that you are nowhere near either brake or gear levers. the latter is a mere inconvenience, but with wandering cattle and sheep, the former involved serious calisthenics moving up and down the bars, particularly into a headwind. to their credit, brompton have positioned a sticker informing that on the drops there is no access to the brake levers. standing up to aid climbing prowess is possible, but not really to be recommended - with the small wheel being virtually under the steering, doing so is twitchy with a capital t. after trying it a couple of times, i resorted to simply selecting a very spinny gear and staying seated on the inclines. the gears took a bit of getting used to, involving as they do, serious combinations between both levers. islay is relatively flat, but i still felt the need to change gear more often than i'd have liked. of course, part of my problem was telling myself that i was riding a brompton, not a bicycle with skinny wheels and bendy bars. the whole process became much more attractive by sitting back (metaphorically speaking) slowing down, and enjoying the ride. 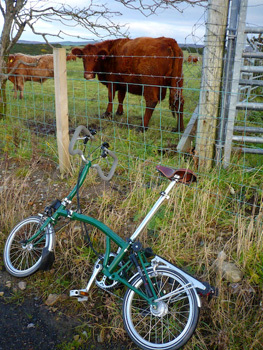 since brompton position this model towards the touring market, taking it out for 40km of single track, poorly surfaced roads, liberally sprinkled with cattle grids seemed like the ideal way to go about the test. that the road also incorporated a section with a ten percent climb just added a delightful frisson to the objective. cycling around agricutlural roads brings the usual array of unexpected joys, many of which have to be braked quite suddenly for. the calipers on the brompton are second to none - short of some of the more feisty hydraulic disc systems or linear pull setups, these were the finest i have ever grappled with. no snatching, no skidding (not that i managed, anyway), but truckfulls of stopping. 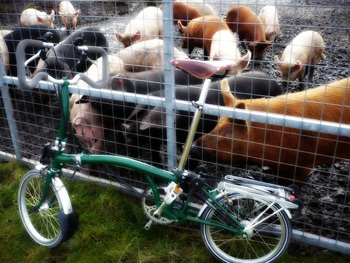 cattle grids weren't as uncomfortable as i'd expected, though i'm not sure that the brompton would agree. the comical part of bumping over an array of metal bars was that the dynamo switched itself on every time - so the dynamo lighting works ok - and noticing that the rear light has a capacitor to keep it lit for a minute or so when stopped. nice feature. when seated, which was most of the time, the brompton is satisfyingly stable, though the riding position, for me at least, was not ideal. the commuting psyche had nor permeated the catlike whisper - my problem, not the brompton's. the handlebars can be tilted forward slightly to give a bit more reach, but if you want to fold it up properly, they'll have to be repositioned beforehand. ultimately, to avail yourself of all the features, things are best left as they are. i didn't carry much on the rear rack (which comes with fitted bungy cords), but whatever you do carry has to be strategically positioned to avoid fouling a pair of pedalling heels, something probably unavoidable given the height of the rack. getting on and off is a dawdle, with no high top tube to get in the way, and the ability to fold it up out of the way when you're home or wishing to use public transport is a bit of a boon. citylink coaches who operate the service to and from glasgow and kennacraig (islay's mainland ferry port) will not accept bicycles unless encased in a bike box or bag - a nuisance if you've nowhere to put the box when you reach your destination. 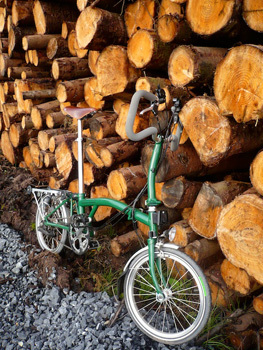 the brompton would be the ideal solution. 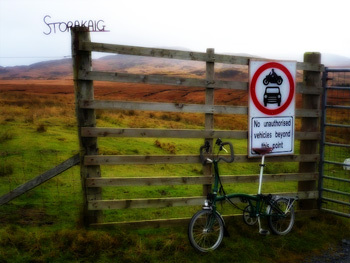 that said, it's not a type of bicycle that could be regarded as a necessity on a rural scottish island. commuting has a decidely different face on islay; no, the buses don't carry bicycles, but probably would do in an emergency. i doubt if our roads are substantially crapper than some inner city paving, but tiny wheels are not the ideal way to go, especially over cattle grids. we don't have trains. it's not the bike for me, but it did survive here rather better than i'd anticipated: if you have very little storage space for a bicycle it is ideal. thewashingmachinepost bike shed had to swallow a museeuw, a colnago, my sons' mountain bike and the delivery boxes for the brompton and museeuw. there was, therefore, no space for the brompton, which currently lives in the porch of washingmachinepost towers. and it's not a big porch. while the test model featured a sturmey archer six speed gear system, brompton have informed that this is likely to be replaced by a new wide range hub in 2009.